There are two types of Iterations: Iterations (Project Iterations, Sprints, Project Sprints) and Team Iterations (Team Sprints). Both are planning Entities. They represent a short period of time during which planned work should be completed. Iterations and Team Iterations serve the same purpose: organizing work for planning, tracking, and reporting. The main difference between them is the scope of work each may contain. An Iteration is a part of a Project and Release by nature. It can contain work only from one Project and a single project Release. Let’s take a look at an example of a sprint planning board. Team Iterations are similar to Iterations, but are not related to a Project. A Team Iteration is related to a Team and can contain work from many different Projects and Releases. The total assigned effort and velocity of Iterations and Team Iterations is measured using a single planning unit (points or ideal hours) across all assigned Entities (work items). For Iterations, the effort unit is defined in the process settings of the Project the Iteration belongs to. 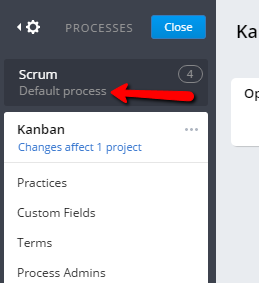 For Team Iterations, the effort unit is overridden by the “Default Process” settings marked in your global settings (Settings → Processes). From 3.13.0, a Feature can be linked to a Team Iteration in the same way a User Story, Bug, or Test Plan Run can. It’s possible to set Team Iteration for Features either manually or to calculate as the Team Iteration of the latest User Story in the Feature. So you can plan Features by Team Iteration then build views with Features cards and Team Iterations as an axis, etc. Iterations cannot contain Features and Epics. However, the sprint and release planning software allows Iterations to contain Stories, Tasks, and Bugs that are part of Features and Epics. Iterations cannot be assigned to cross-project Releases. In Targetprocess’ sprint iteration planning tool, you can select, hide or highlight data in Views and Visual Reports by Sprints (Iterations) or Team Iterations and related properties using Advanced Filters for Sprints (Iterations) and Team Iterations. In case of multiple related projects running together, you may want to coordinate them with cross-project Releases. When a team is working on many projects at the same time, you can plan and organize the team’s work with cross-project Team Iterations. Team Iterations are not directly connected to Releases and cannot be assigned to them. However, it is still possible to link Team Iterations with Releases. More information on this: How to link Team Iterations and Releases. Sprint planning is an essential factor in the success of any agile project. Your team’s agility is dependant on your tactical and strategic approach to sprint iteration planning. With Targetprocess’ sprint and release planning software, you gain full visibility into a project’s progress and facilitate both communication and accountability within your company. Create clear and intuitive sprint planning boards to share with your entire team in a matter of minutes.